SVH fundraising event most successful to date. PITTSFIELD — Adults and children took a break from playing duck-themed games or enjoying grilled hot dogs and fresh popcorn in Manson Park to watch hundreds of rubber ducks racing toward the finish line during the Fourth Annual Sebasticook Valley Health Duck Race for Breast Cancer Awareness last month. 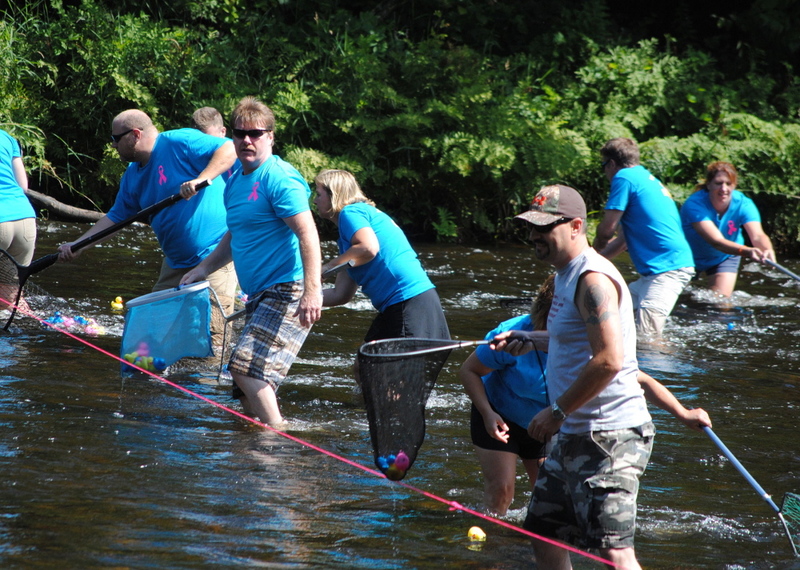 Plunged from the Hunnewell Avenue Bridge, hundreds of pink, blue and yellow ducks floated down the Sebasticook River into the nets of SVH employees and volunteers. The race was coordinated by the SVH Women’s Health Center staff to raise money and awareness of the Nancy Stone Fund, which has provided breast care services for uninsured or under-insured women seeking diagnostic services at the hospital. This year’s winning duck was purchased by Kristi McGown of the SVH rehabilitation department, according to a SVH press release. For more information, call Jennifer Yarbrough at 487-4024.